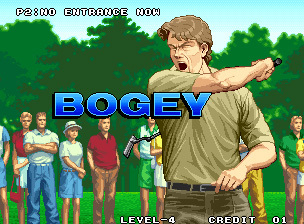 The makers of Metal Slug give you... golf! George Carlin once said that golf is like watching flies...um, copulate. And he's right--it's pretty boring as spectator sports go. 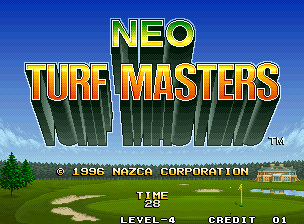 But Neo Turf Masters boils golf down to its essences to make an arcade game that's faster paced than its source material, but still respectful of the sport. And defying all logic, it's from Nazca--the Metal Slug people! Neo Turf Masters offers four different golf courses in locations around the world--Germany, Japan, the U.S., and Australia. At 18 holes each, that's 72 holes--a heck of a lot of golfing. One quarter gets you three holes of play, but the better you do, the longer you play. Birdies and other under-par shots are rewarded with extra holes, while shooting over par (bogeys) will reduce your holes left and shorten your game. If you can't cut it, you're cut off. Like its arcade counterpart Golden Tee Golf, this is the kind of game that was designed for players who have a frosty beverage in their hand--simpler is definitely better in this case. Aim with the stick, adjust for wind/hook & slice with the B and C buttons, and tee off with A. A standard power meter (tap A once to set your power, tap it again to set your height/accuracy) makes sense immediately if you're a newbie and will be comfortably old-hat to anybody who's ever goofed around with Links on their PC or Mac. Neo Turf Masters strikes a nice balance between exploiting the Neo hardware (there are some nice plane effects when rotating to line up your shot) and keeping things clean and clear. 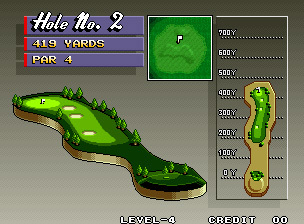 There's always an overhead map of the hole during play, and the power meters, club selection, and wind indicator are all kept to the borders of the screen, nearby but out of the way. The downside, however, is the low resolution of the main graphics. 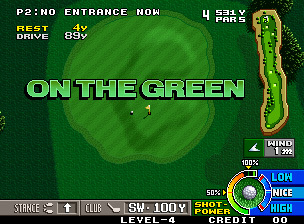 The fairway texture is a generic green tile, there are giant pixels in the foreground when you tee off, and the player models have a lot of frames of animation but low detail. 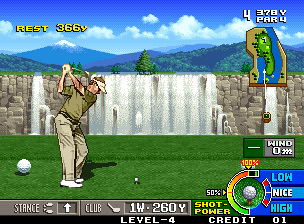 Then again, there are nice surprises too, like the waterfalls on the third hole in Japan, and the large cut-scene graphics are pretty. Ultimately, the designers were wise to sacrifice visual flash for a clean presentation. There's no doubt that there's a clone of the Copacabana in Hell, and sometimes, you'll think that its music is being piped from the nightclub of eternal damnation straight into your Neo cabinet. However, it's just... so...BEAUTIFUL. The arrangements of the way-too-cheesy, way-too-happy lite-jazz songs are not only different for each course, but absolutely perfect, and since golf is the kind of game that attracts older males, well, this soundtrack is practically a mating call. Sound effects are crisp too (the "thunk" of the ball in a cup is particularly satisfying) though the female announcer is a little stilted--English obviously is not her first language, so it's okay. Again, 72 holes is nothing to sneeze at (even if some of them are similar, at least they're generally challenging and well-designed). 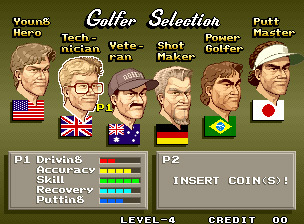 Plus, with six golfers offering varying strengths plus randomized wind conditions every time you play, this is one game that you can return to repeatedly. Video golf is like watching The Last Starfighter. You'd never admit to your friends that you find it enjoyable, but now and then, you do get a kick out of it. 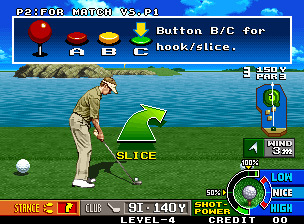 Neo Turf Masters is one of the nicest forms this guilty pleasure has ever taken. The learning curve is nil, so newbies can enjoy it instantly, but there's enough depth, strategy, and tweakability to make it continually interesting for vets and real golfers. 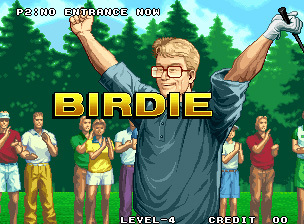 At $50-75 on the low end, a Neo Turf Masters MVS cart isn't cheap--but there's a reason it's so pricey, and that's sheer gameplay. This game's got broad, immediate appeal. Hey, if you were an arcade owner, would you get rid of it?